back yard, two car garage. bath, and has it's own television set. Second bedroom has two double beds. There is also a television set in this bedroom. Third bedroom has two single beds. Dining room is complete with table and six chairs. There is additional seating for two at the breakfast nook. chairs on the patio for your relaxation. Also a large propane barbeque is provided for your outdoor cooking. Built in dishwasher. Also garborator in sink area. Blender, juicer, popcorn popper, spices, mixer. Complete with all linens, and 3 TVs. Microwave, washer, dryer, and dishwasher are supplied as well as complete dishes and utensils. There is a barbecue for your enjoyment. Free long distance to Canada, all of United States and Porto Rico. Free Wi Fi. 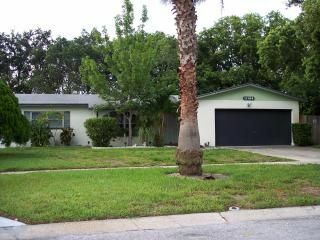 Located on quiet cul-de-sac, and approximately a ten minute drive to Indian Rocks Beach. Privacy fenced yard. It was nice location.close to the 3 beachs and places to eat. It was a fun vacation. Needs some updates on pool n rooms but other than that it was fun and enough space. Close to beachs . shops and food. My husband and I came down to look at houses. It was a great central location for access to all areas in Tampa. The home is nicely sized and the patio and pool are great! I would highly this house! Thank you so much for your review. I am glad that you had a good time. It exceeded our expectations. Absolutely wonderful. I am happy that you enjoyed yourself. I am so happy that you enjoyed your stay. We ask that guests refill the cannister if they empty it. I am sorry that you had this inconvenience. My family and I rent a home every year and drive to Florida from NY. This was the worst experience we have had so far. We drove 21 hours to get there and were confronted by the neighbor who was less than friendly and told us we better not park on the lawn. Upon entering the home we noticed it was very hot! The thermostat read 86 degrees. We got there on a Monday night so we figured we would give it to the next day to see if it cooled down. The next day we contacted the owner for her to tell us that she was upset that we contacted her because she is Canadian and it was a holiday for them. The rental company sent out maintenance and they had no keys so we had to sit there most of the day to wait for them to drive an hour to get the part then back. A few hours later they told us it was fixed and left. We came back later on to find it was still not working. The next day was the 4th of July so we called the emergency line. He told us they had to order another part and they were supposed to tell us that and they never did. So they came back out Thursday to put the new part in and the air still never got lower than 78. So needless to say we wete without air our 7 day trip and it was in the 90's outside! We were harassed by the owner who was telling us that the neighbors told her that we had more than 6 adults in the house and she was going to charge us when we only had 3. Even though her ad said the house sleeps 6. The owner was very rude and unprofessional! She never once apologized for anything and was upset with us and nasty! My children did not need to see the other neighbor watching his ADULT movies from over the fence because they dont have the decency to hang blinds. It's was sad because the house was great. There also was no directions on how to work things, if we need to do anything specialwith the pool, check out instructions our anything. It was an overall bad experience. The home has a double driveway and there was no reason for you to be parking on his lawn. He politely asked you to move. Unfortunately the air conditioner (which is only one year old) broke and a service man was called. The rental company DOES HAVE KEYS as does the gentleman who looks after the property and you refused to leave the house because of your many valuables that you were travelling with. You arrived Monday night and the air was repaired on Tuesday morning, so I fail to see how you did not have air for seven days. You complained about the telephone service, the internet service and the fact that you did not have control of the pool heater - which was set at 89 degrees. The fence is six feet high and if your children (who were not included in your reservation) could see over the fence, you must have had a step ladder with you. As to the part of adult movies, all my neighbors have blinds on their windows so it would be impossible to see into their homes. Your original reservation indicated four adults only, NO CHILDREN. Also you wanted me to provide you with an instructional booklet as to the workings of all appliances, etc. I can certainly see why you have rented four different houses in the four years you have been travelling to Florida. We frequently travel to this area and this is our first stay at this house. We loved the pool and having the master bedroom with ensuite bath separate from the rooms our kids stayed in. The use of the garage with opener was a huge bonus. We never had to get into a hot car. House is equipped with premium fios tv with WiFi and a huge HD flatscreen in the living room with 100’s of channels as well as TVs in 2 of the other bedrooms. Kitchen was well equipped and on site washer and dryer were a big plus as we did a lot of laundry with 2 kids. many attractions that will please both young and old alike. Dali Museum and downtown St. Petersburg. There are many golf courses in the area, both municipal and public for those so inclined. Weekly Rate: $950.00 Monthly Rate: $3800.00 Weekly rates: Unavailable February or March The Florida State Tax of 12% is included as are all maid fees. A deposit of 20% is required when booking. Balance is due fourteen days prior to arrival. There are no refunds unless reservation is cancelled thirty days prior to arrival.